1). This guy has come up with some really nice raised garden beds. I love his idea of lining the inside with insulation to keep the beds at a nice temperature--not too hot in summer, not too cold in winter. I would like to try building a couple of beds like his. 2). He has tips for extending the growing season all winter long. 3). Though it's not stated specifically in the article, the photo of the spacing of his plants demonstrates the biointensive method of planting, which I am very interested in. 4). This is a little more abstract, but I really love the pictures in the article because it shows the gardener's property pretty well, and it's obvious he lives in a typical suburban neighborhood. Not a sprawling country acre, but a standard-sized suburban lot. I find this very encouraging. As we face food shortages and the probability that people will have to start growing food, it's nice to have good models of how it can be done, in every situation and property size. Seed templates made from old truck tire flaps help Arthur Stahlhut make the most of the planting space at his Fort Wayne home. Published: October 14, 2012 3:00 a.m.
Raised beds outfitted with hoop frames can be covered with agricultural cloth and function as mini-greenhouses in Stahlhut’s backyard. Holes drilled in a diagonal pattern allow the master gardener to space plants four inches or six inches apart. When most area gardeners are readying their vegetable beds for a long winter’s nap, long-time master gardener Art Stahlhut was out in his garden pointing out his newly sprouting lettuce. If things go according to plan, say Stahlhut and his gardening partner, Karen Fecher, both of Fort Wayne, the garden will have the same outcome as last year. “I had the most beautiful fresh lettuce mix for my Thanksgiving table,” Fecher says. Stahlhut believes in extending the season for vegetable growing – which usually means he harvests something in virtually every month of the year except January. This year he’ll have tomatoes on the vine well into October and lettuce, spinach, onions and carrots well into November. Last year, with the mild temperatures, he pulled plump red radishes and harvested romaine lettuce the first week in December. Stahlhut says he doesn’t fight Mother Nature – he just plays to her gentler side so plants get what they need, whatever the calendar says. His secret, he says, is growing veggies in eight raised beds, which he designed and built himself, and covering them when appropriate with hoop frames to create mini-greenhouses. He’s refined his techniques over the years, with his most recent beds consisting of a frame made with sturdy two-by-fours to stand about 20 inches tall. There’s no real reason for the exact height, he says, “except I have bad knees.” Twenty inches gives enough room for root development while alleviating the need to have to kneel to cultivate, weed or harvest, he says. The bottom of each bed is lined with wire mesh with landscape fabric on top of it, “to keep critters out,” Stahlhut says. The sides are filled in with 16-inch-square patio tiles two inches thick. The sides are then lined with thin foam insulation sheets and then even thinner sheets of metal flashing to keep in warmth. The metal also makes tilling with a small roto-tiller possible without tearing up the insulation, he says. Beginning in early fall, he adds to some of the beds what gardeners call “hoops” – curved arches made of metal wire or conduit pipe that are covered with translucent agricultural cloth. Stahlhut, who helped create raised beds for vegetables at the demonstration garden outside the office of the Purdue Extension Service at IPFW, says the raised beds allow him to control the soil composition and temperature. He uses layers of grass clippings and shredded paper and horse manure for the bottom half, and swears by a mixture of one-third peat, one-third compost and one-third sphagnum for the top. He calls it the “lasagna method” because of the layers. He makes his own compost in one of the raised beds. “We don’t use synthetic fertilizer,” he says, adding that he doesn’t pull out tomato plants at the end of the season, only cuts them down to encourage worm action in the soil. Another of Stahlhut’s secrets is intensive planting. To get more out of his small spaces, he has made seed templates from, believe it or not, old truck tire flaps into which he’s drilled two sizes of holes for even seed placement. He also occasionally intercrops. “The rule of thumb is you can feed a family of four from a garden the size of a two-car garage. Well, we only use half that size, but we use every square inch of it,” he says. As for tools, Stahlhut says a thermometer that reads both high and low temperatures is essential, especially at each end of the growing season. So is keeping a close eye on the coverings, because the soil can quickly get too warm even in cool weather and “fry the plants,” he says. They’re held to the hoops with giant clothespins, so they’re easily removable. Fecher says covering crops keep them warmer in the spring and fall and shades them in the summer. She says they saved a lot of lettuce from bolting when the weather turned quickly hot this year. Last week, after temperatures dipped to freezing, the cover raised the ambient temperature to 65 degrees with a couple of hours of sunlight. Stahlhut doesn’t use plastic to cover his plants but does use a conventional cold frame with plastic sides and top. The pair has been selling lettuce and other veggies at the Historic Main Street and South Side Farmers Market. “We want to get more into production. Right now we can’t grow it fast enough. We’d sell out every time,” Fecher says. Stahlhut says he travels to regional gardening meetings and festivals, reads a lot and watches gardening videos to get ideas and learn new approaches. 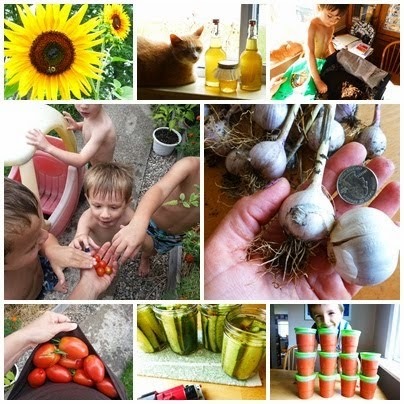 Two favorites videos are “Develop a Sustainable Vegetable Garden Plan” by Homeplace Earth and “Growing Greens for Love and Money” by Susan Moser. But mostly he likes to experiment – whether it’s growing different varieties of garlic or planting peanuts in a bed under the lamp post in his front yard. “It’s always a work in progress,” he says. © Copyright 2012 The Journal Gazette. All rights reserved. Neither this material nor its presentation may be published, broadcast, rewritten or redistributed. If you caught my blog post from just about a year ago, you might remember that we had a pumpkin patch. It grew from the seeds of a jack-o-lantern, and we ended up with only two pumpkins (I cheated and staged some more pumpkins from the grocery store so that every child could take one home--they never knew!). Well, this year was a wild success in comparison! I make a lot of special memories with all the kids in my care. However, the nature of my job as a daycare teacher requires that I say goodbye when the early years pass. I often watch a child from babyhood, through toddlerhood, and then preschool age--and those years are absolutely precious to me. I've been lucky that most of my daycare children stay for the 'long haul' through all those years...turnover is low. I treasure the time spent with all my little ones, watching them change and grow. It was time for sweet Maggie to enter Kindergarten, and her days spent here would now be spent at school. I've been through the goodbyes many times before in the 9 years I've been doing this job, and it never gets any easier! Luckily, Maggie's mom has made the transition so wonderful for us all by bringing her for visits when she has days off school. Her daycare friends and I LOVE her visits! After one such visit, Maggie and her mom decided to bring me a gift. I was so completely touched by the surprise. It was a beautiful collection of seeds, handmade seed markers, seed starter mix, a mini-greenhouse, and adorable little planting pots. Needless to say, I was speechless at the thoughtfulness of this gift. Of the various wonderful seeds Maggie brought for me and our garden, a packet of pumpkin seeds immediately caught my eye. I knew we were going to have a great little pumpkin patch using them. We planted the seeds the the late spring (only 6 seeds total--2 small hills got 3 seeds), and watched the pumpkins develop from tiny green bulbs to perfect little orange cuties, just like we did last summer. It is an excitement that never gets old. This year I definitely did not have to cheat and add in a few store bought pumpkins; our tiny humble patch produced THIRTEEN perfect tiny pumpkins! The best part about the pumpkin patch is that harvest time occurs when the rest of the summer crops in the garden are gone. It brings us back to the now brown-and-scraggly garden so that we can see the results of the summer's pumpkin babies. It keeps the garden in our minds--and for me, it gets me thinking of what fall crops we can put in, because I just don't want the growing to end! There is just something magical about kids and pumpkins: they adore them, and get more excited to harvest them than any of our other crops. Here we are on our journey our little pumpkin patch this week. We are officially ready for fall! We got out to the garden a couple of days ago, and on a whim, wheeled one of our yellow dump trucks with us. It made a great container for us to fill up with all the last-minute yellow pear tomatoes we could find. It was like a treasure hunt, peering into the jungle of tomato vines, trying to spot those beautiful golden gems. A few tiny red tomatoes were hiding in there too...which promptly ended up in Noah's mouth as a juicy snack! After loading up the tomatoes, we made a big production of driving the dump truck into the house, where we ate most of them with our lunch. Some ended up in a pile on the counter, next to the last of our green peppers and one lone cucumber. Each day we have been filling up our pockets with any green tomatoes we can find. The kids have found this hilarious: scandalous, even--for all summer long I have emphasized to ONLY pick the yellow or red tomatoes, NOT the green. They think they are getting away with something, plucking the green ones! But alas, all those green tomatoes are coming inside with us, for the warm ripening days are over. Of course tomatoes taste best when ripened on the vine, but we will try to get some more out of our last harvest by placing all the underripe ones into a paper bag with a banana. The ethylene gas released by the banana as it ripens will also help the tomatoes reach their potential. Last year we tried the same technique with an apple, and got pretty good results. I read that bananas release much larger amounts of ethylene than any other fruit (like apples), so we are curious to see if we get better results than we did with the apple. A Sunflower House is an awesome garden experience to work on with the little ones in your life! Our dreams of a sunflower house started when I checked out a copy of Roots Shoots Buckets and Boots by Sharon Lovejoy. What a magical book! With soft watercolor illustrations and easy to read instructions (she calls them 'recipes'), Lovejoy showed us such wonderful ideas: a pizza patch, a tub of potatoes, a butterfly garden. This book is such an amazing tool for drawing kids into gardening, that I actually bought a copy of it. We like looking the pictures and reading about the ideas during story time. The illustrations for a Sunflower House project drew us in immediately. A clubhouse made of sunflowers! The kids were all as mesmerized by the idea as I was, and we started making big plans that very day. This 'RECIPE' is not from Roots Shoots Buckets and Boots, but it looks great, too, check it out! Now, things did not go as smoothly as I'd hoped, in the beginning. It took us a lot of tedious labor just to prepare the trench into which the seeds would eventually go. With the first plunge of our trowels into the soil, we realized we were actually digging into a bed of stones. Using a large shovel and several trowels, we spent hours (spread out over several days) scraping out stones, filling our little wheelbarrow, emptying it, repeating. I simply could not believe how many little stones could take the space of a tiny trench! Next we filled the trench with soil. The most exciting part came when we put in the seeds. We had several different varieties of sunflowers (which I had found at the dollar store for 3/1.00!). We followed Lovejoy's 'recipe' for measuring out the space between each seed, and alternating varieties in order to create a variegated wall of flowers. This took much more concentration than I had expected (I ended up with quite a headache, actually). THEN the struggles really began. Within two days, almost all of our seeds had been very obviously sabotaged. Only little, empty holes remained. Some critter had come to feast, and I can't say I blamed them. I mean honestly, there is not a much more tasty seed to eat than a sunflower seed! I was chagrined to think of all the concentration that had gone into the careful measuring, counting, planning—all for the benefit of some tiny paws (or beaks) set on indiscriminate devouring. We put more seeds in. This time, we just sorta kinda followed a plan. The holes left by little digging paws showed us where to replace the seeds, so no measuring. Result of planting effort #2? Almost every seed, dug out and eaten. A few of seeds that had survived the first planting were starting to sprout. Out of those, 2 had been sliced, I'm assuming by cutworms. We were already into the 3rd week of attempting to start our sunflower house, and feeling a bit gloomy. I had an 'aha' moment, after stewing for an entire evening about the critters that had found a free buffet in the yard. I thought we could start the seeds indoors, and then after the plants were bigger, stronger and less vulnerable to attack, we could transplant them into the trench. For 2 whole weeks, we nursed the indoor sunflowers sprouts. By now we are pretty good at taking care of indoor starts—and I had confidence in our success due to the wild success of our tomatoes (which we started from seed this year and were at that point really starting to take off outside in the garden). The day came for the transplant. Lovingly, gently, we put all the seedlings into their homes (and at this point I was still sort of trying to alternate varieties as we went along). AND....within the DAY, all the sprouts DIED. By now, my enthusiasm had been transformed into pure and utter frustration. I still wanted the kids to get a chance to have a sunflower house. I still believed in this project and could still see, in my mind, the magical playspace we had dreamed of. They had begun to look at me suspisciously whenever I talked of our sunflower house plans. They didn't trust that the whole idea was even true anymore, and probably thought it was all a fairy tale. The project was no longer something they were thrilled about, so I sort of had to forge on with this one on my own, still determined. I took the rest of the seeds that I had (plus I went the dollar store and bought the rest of their packets—not a huge loss at 3 packs for a dollar), and went on a seed planting frenzy. No measuring, no careful sorting and alternating. I just took those seeds and started pushing them into the ground, one after another, going around the perimeter several times. I may have cursed at the seeds a couple times (so much for tender loving care), so it's a good thing the kids weren't around during this planting. Sprouts began to not only come up, but thrive. Critters stayed out of sight (I am pretty certain the neighbor's trusty cat had a lot to do with this. And I am also pretty certain we praised that cat profusely when we saw him stalking a chipmunk). I began to really believe that we might have success, and the kids began to notice that something was happening with our seemingly abandoned project. Fast forward to now—after weeks of tending the finally successful sunflowers--and the dream has become a reality. Once the sprouts established themselves all they needed was occasional watering. The kids now have a magical place to play. With no prompting from me, I find them in there with their snacks, books, or just hanging out. The bees have come to our flowers in droves. Initially this alarmed a few of the kids, who are terrified of anything that buzzes. I explained that the bees won't usually sting if they are left alone, and that they have a wonderful job--helping all plants to keep growing and thriving. The kids have learned to get excited when they see a bee happily crawling around on one of the flower's faces. We can see the sunflower house from Noah's bedroom window, which is a nice touch. When it's not quite time to go outside for the day, the kids can peer out the window at the wonderful thing we have created! All the struggle, hard work, and frustrations were absolutely worth it, and you can bet that a sunflower house will grow in our yard every summer from now on.